More Than ISIS Survivors. They’re Our Sisters. Many people carry a certain image of Iraq in their heads. They see it as a place of endless warfare and little else, a place that was hopelessly mired in chaos long before ISIS came on the scene. “Shingal was so nice,” adds Marwa, Gozê’s sister by marriage. That’s what the Yazidi people call their homeland. Others know this patch of earth that hugs the border between Syria and Iraq as Sinjar. For Gozê and her sisters, life here changed forever on August 3, 2014. The world they knew was suddenly ripped apart. A terrifying new hell took its place. Heavily armed militants arrived, bent on wiping their people, the Yazidis, from the earth. ISIS crushed everything Gozê had. Clothing at a mass grave in Sinjar, where ISIS executed hundreds of Yazidis. Photo by Erin Willingham/Preemptive Love Coalition. Gozê fled up Sinjar Mountain, along with loved ones and neighbors. They endured days of deprivation under a blistering sun. “There was no food, not even stale bread,” she says. “There was no water, either.” All around them, people began to die. Each of Gozê’s sisters has a similar story. Marwa had to watch as ISIS turned up suddenly and murdered her father, mother, and brother; she was left to clean their bodies and figure out what on earth to do next. Sozan lost her 7-year-old daughter; she died of starvation when her family took refuge on the mountain. The militants below were all too happy to let time and hunger do their genocidal work for them. Still another, Hazno, had to flee while pregnant and sick. Sozan’s daughter died of starvation during the ISIS siege. Photo by Matt Willingham/Preemptive Love Coalition. Almost two years later, the pain is still visible on their faces. But these women exhibit a quiet strength, too. Their courage and resilience have helped them endure the unthinkable. 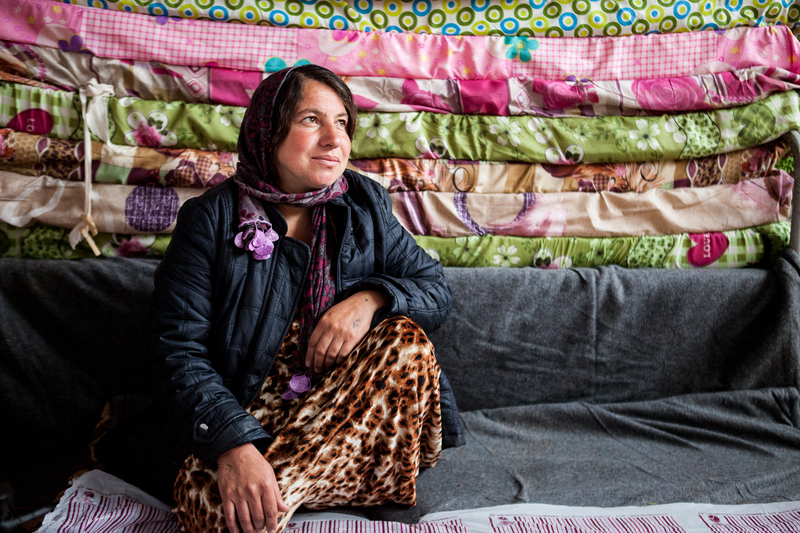 After escaping, Gozê and the other women and their families traveled on foot to Syria. From there they went by car, in search of somewhere beyond ISIS’s reach. They had nothing left. “Not even a tent,” Gozê recalls. What would you do if you lost everything you had to those bent on your destruction? Gozê and her sisters eventually made their way to the northern Kurdistan region of Iraq. This region offers relative safety and security, but nearly everyone here speaks a different dialect. There is no work for the men who survived the ISIS genocide. There are no schools for their children. They were left to make a home out of a leaky shipping container in the middle of a muddy field. Gozê and her sisters started rebuilding their lives… by making soap. The soap trade goes back at least 4,000 years here, when ancient Mesopotamians first started mixing water, alkali, and cassia oil—history’s earliest recorded soap recipe. But the craft was new to Gozê and her sisters. When they came to Kurdistan, we showed them how to make soap. We helped them start their own soapmaking business so they can earn a living and provide for their families. By learning this ancient craft, they’ve begun to undo the devastation wrought by ISIS. Every bar they sell is another step toward reclaiming their lives. The training and equipment they received is a crucial step toward a more prosperous future. To us—and to you—Gozê and her family are more than refugees. They are more than what others have done to them. They deserve more than a bandaid solution to their current situation. By teaching them a trade and helping them start their own business, you are providing more than mere aid. You’re giving them a source of income, a way to pay for diapers and milk and other essentials. You’re empowering them to care for others in need, as they produce thousands of bars of soap for use in refugee camps across Iraq, to help stop the spread of disease. You are standing with your sisters in Iraq, providing a hand up rather than a handout. Their soap—it is as beautiful as the hands that labor over it. Not just because of what goes into it: natural ingredients like olive oil, herbal tea, chamomile, and eucalyptus. But also for what it’s done in the lives of Gozê and her sisters. Sisterhood Soap does more than cleanse. It washes away the effects of hatred. It unmakes violence. It empowers women who have lost everything, so they can remake their world. Most of their soap is sold locally in Iraq, but we’re also sharing it with you. You can purchase Sisterhood Soap as a way of remembering their story… and helping them write a new one for their families. But this is about more than buying a few bars of handmade soap. This is about empowering your sisters. Standing in solidarity. Refusing to give ISIS the last word. There are many more families who were driven from their homes, displaced by violence, and left with nothing. There are many more sisters who are just as determined to carry their families through the darkness. And you can stand with them. You can empower women like Gozê, Sozan, Marwa, and Hazno. You can hold the work of their hands—a tangible reminder of their future—in your hands.